Ah, the first question anyone new to buying flowers online asks: how do I know that these flowers are high quality? While this is a simple and logical question, the answer is far more complex. As with any other perishable or fragile product, the value of the delivered bouquet depends on the relative excellence of the online retailer. 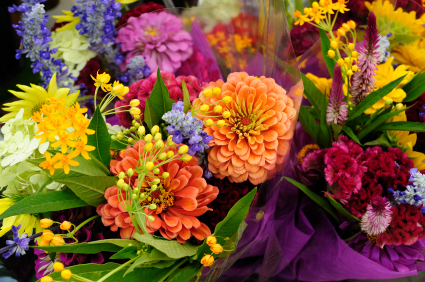 Think of buying a bouquet the same way you would think of buying a carton of milk. If you buy the milk from a major market, where the market stakes its reputation on the quality of the foodstuffs it sells, you will probably get good milk. However, if you go to the cheapest corner store you can find and get the cheapest discounted milk they sell, your experience may differ. Fortunately, the Internet makes it relatively easy to get reviews. Simply run an Internet search on your online mega-florist of choice and the keyword "reviews." Do not get discouraged by one or two poor reviews. Every business will have an off day. If you do find a review criticizing the site, look at the reviewer's location, if listed. There are innumerable mishaps that can befall the bouquet after it leaves the e-florist's warehouse, the most common of which is heat or cold damage from the postman leaving the bouquet outside someone's door for extended periods of time. If the dissatisfied customer lives in a very hot or very cold climate and complains of wilted flowers, this may be why. Logically, it makes sense for the largest online mega-florists to produce high quality bouquets. If you visit a small local florist or a grocery store's flower aisle, you will notice that the bouquets do not change very often. Not enough people purchase the flowers. Consequently, very few new, fresh bouquets are added to the selection. A larger online florist does not have this problem. Due to the volume of traffic and the frequent purchases, the online florist moves their stock quickly enough to make it profitable to keep replacing the old stock with fresh flowers. The online florist also has a reputation to maintain on the Internet. Since it is so easy to post a review, it is important for the florist to ensure that customers receive good flowers. Finally, since the giant online floral companies are such big businesses, they can command the full attention of their suppliers. The floral distribution companies that supply 1800Flowers.com and FTD.com gain the majority of their funds from these giant companies. Therefore, the floral distribution company will take steps to ensure that the e-florist gets the very best plants available. A small local florist who only produces a few thousand dollars of business cannot command that same clout with large warehouses and distributors. If you take basic precautions and use common sense, it is easy to find extremely high quality, fresh flowers on the Internet. By searching for site reviews or getting recommendations from others who have ordered online, you can find a reputable online florist and get a beautiful bouquet delivered to your doorstep.